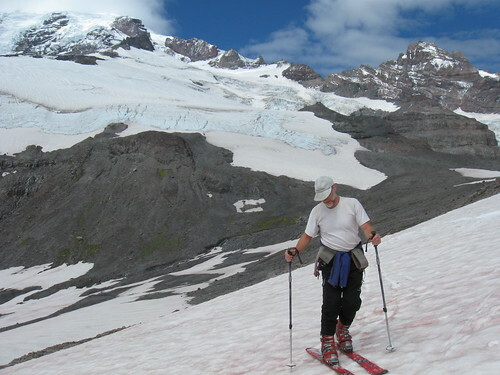 The glacier was not visible until we were below Cowlitz Rocks, but the snow cover was constant above about 7100'.� Far climber's right was a straightforward skin following the others' turns.� We traversed around the shrund after scouting a fall-line path for the way down, and hit the edge of Muir below Anvil.� The higher we got the more new snow appeared; from 8500' to 7300' or so were long swaths of 1-2" fresh crud, windblown in places, that we could link in the fall line.� A decent line skier's left of the big lower crevassed section should last another week or more, esp. with cooler weather. Way to go Mac. Glad to see you making the most of it before "back to school"
Way to get it Andrew and Telemack. I was looking at the Paradise glacier while grinding my way out of Stevens Canyon on my bike Friday. I was thinking that the two of you where getting a better ROI for your efforts (I had a while to contemplate this...). 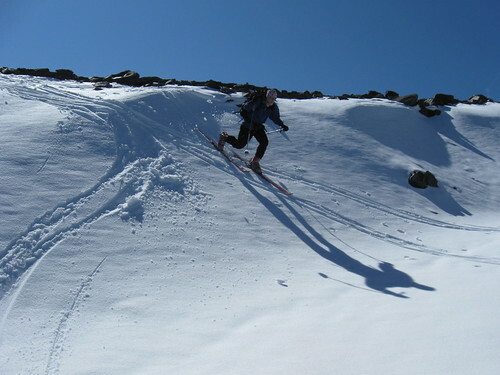 Glad you found some good skiing. The mountain looked spectacular with the whitewash up high and the meadows were as lush and full of flowers as I can remember for August. It was a nice day to be out. 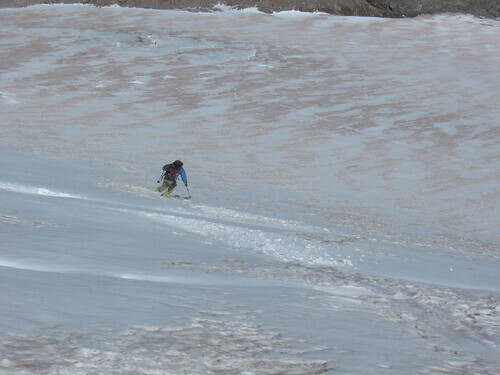 As telemack said, access onto the glacier appeared to involve steep, loose rock and/or bare glacier ice until we traversed NE updrainage to the cleaver that separates the Paradise from the lower Cowlitz. If the snow tongue between the bare glacier and the cleaver melts, access by scrambling up the cleaver looks feasible and not too onerous. Above that, the glacier is still in very skiable shape, although with some medium-large cracks showing, but easily avoidable. It'd be fun to ski the steeper headwall earlier in the season. Also, it appeared that the Wilson Glacier and the turtle (approach for the Kautz climbing route) are still in good shape. Someone should go ski those. It looks like the snow level is below 8k again. Happy Augury! On the N side of Cowlitz Rock, view of lower Paradise Glacier.